Finding the time to devote to your own website revamp is difficult for a digital marketing agency. One, there are work pressures, unevenly distributed as usual. There is the daily anarchy of fires to fight, new business challenges to tackle, ongoing projects to manage, meetings to attend, and more. In this, your own website plans always take the backseat. Worse, when it comes to an digital marketing agency website, there is the added pressure to produce something that defies the ordinary. So even though work starts on it, the lack of satisfaction and agreement with initial iterations delays and postpones the website launch. Third, the digital marketing business evolves too fast. Much of what we were doing about 3-4 years ago is passe now. The offerings have changed and so has our experience with digital marketing. The Case Studies need to be updated. The team has changed. Getting on top of all this takes time. When you finally launch the revamped website, after all the trials and tribulations it brings in its wake, it is indeed a big deal. When peers acknowledge your effort, as they did in the ProcessWire Weekly, the satisfaction is doubled. Pigtail Pundits was nominated Site of the Week in the ProcessWire Weekly Issue #226. The whole subject of digital marketing is abstract and fuzzy to most clients. For that matter, even to most agencies. Jargon, complicates its understanding further. Jargon, we believe, is also used strategically by many in this business to confound the listener. We wanted to steer away from that. Our strategy was to use a familiar metaphor to describe the digital marketing solutions that we provide. How does digital marketing benefit our customers? Why should they insist on ROI from their agency? What guarantees can they get from it? Hopefully, we have done it a way sans the jargon. Or that’s what we thought. Equally, we could introduce some flavour into the language that metaphors do allow. Metaphors, by the way, are double-edged swords. It clarifies and also confuses. It tickles your imagination. It also puts people off. Extreme reactions, we felt, are far better than neutral ones. That was a risk that we decided to take knowing the consequences. We likened digital marketing to selling the produce of an orchard. The theme we finally chose lends itself to some delightful metaphors which are not part of the usual digital marketing lexicon. The aggressive tone of the sell is blunted beautifully by the metaphors. The metaphors color both the language and visuals. The overall effect of this is singular. We also attempted to peel off some of the fuzziness that exists in digital marketing, especially in India, using copy. We tried to identify with the pains of the customer and then focus on our solutions as the best answers to the pains. The copy flows from the StoryBrand framework by Donald Miller. For the last 4-5 years, we have been using ProcessWire Content Management System for most of the website builds at Pigtail Pundits. It’s simply the best CMS out there - fast, elegant, no bloat, easy to use, and eminently customisable. We used ProCache for fast page speed, form builder for contact and downloads. All this is our point of view, not yours. What do you think of the new design? Let the bouquets and the brickbats flow. Entrust your digital marketing to experts today. 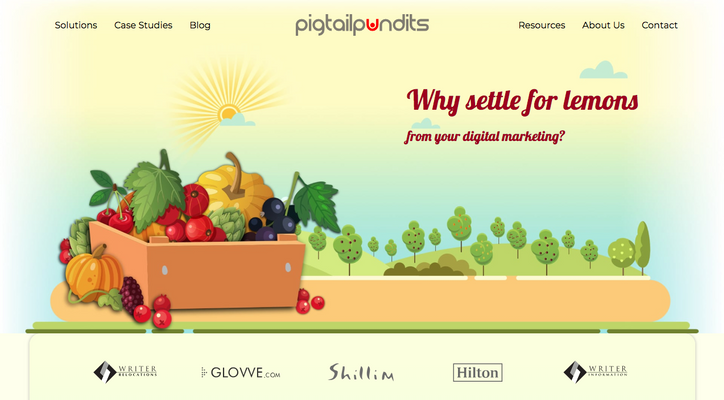 If you need help with digital marketing services, give Pigtail Pundits a call at +91 983 307 1725. Or do write to us here. We help businesses all over the world get better ROI from their digital spends. We specialise in Pay-per-click advertising, Social Media Outreach, Search Engine Optimisation, Conversion Rate Optimisation, Premium websites that convert, Content Marketing that works, and Awesome Training for your In-house Teams on digital marketing. If you're keen to listen in to digital marketing conversations that answer pressing online marketing challenges, do join our Facebook Group. Come, share this article and show us some comment love. If you found this article to be interesting, do share it with your friends. Wish to comment on it with your own observations? Go right ahead and use the comment box.